Authors, professors, history buffs -- Do you have a partially finished Lincoln manuscript stashed away? Now is the time to review it, polish it up, and send it to the Journal of the Abraham Lincoln Association for possible publication. Perhaps you have an unpublished scholarly presentation which may be suitable as well. In any case, click on the Submission Guidelines link (below left) for details about submitting your manuscript. If you are an academic, encourage your graduate students to submit high-quality work. Note that although the Journal seeks articles, it assigns book reviews to designated scholars. The Journal has converted to on an online management system and handles all its submissions online. Some tips: You need to submit a completed, annotated manuscript, not a query. 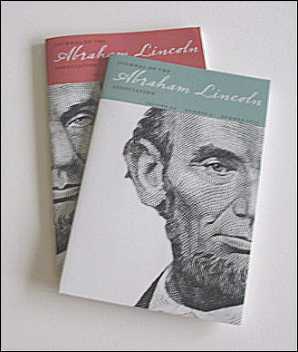 Your work will be reviewed by the editor and anonymously by well-regarded Lincoln specialists. If you are not accustomed to writing for scholarly periodicals and need feedback, you can ask for suggestions to improve your work. Christian McWhirter, Journal editor, offers these insights into his editorial perspective: "I'm trying to have a fairly expansive idea of what qualifies as a Lincoln article, so it doesn't have to be some biographical aspect of Lincoln. It does have to be Lincoln-related. It needs to be something original, something new -- either a new topic with fresh research or a substantially fresh take on an old topic. We're a scholarly journal so we need thorough footnotes, and interaction with primary sources, not just secondary literature. We also encourage articles on documents: new finds and discussion of a document find that says something really substantial. Lincoln's legal career is important as well; we'd like to see more articles about that. I'm a cultural historian, so I'm interested, too, in newer fields of history -- such as Lincoln's impact on society, Lincoln in memory and literature, even Lincoln monuments." If you're not familiar with this publication, click on the Journal link (below left) to browse past issues. This must-have scholarly periodical, published twice a year, is provided as a benefit to members of the Abraham Lincoln Association.